There are a bajillion different mutants in the X-Men corner of comics, and I’m sure more than a few have been left by the wayside over the decades. But what about Phantazia? She looks cool and she was a female member of the Brotherhood of Mutants before it was cool! Phantazia is one of those weird characters who pops up in a specific role, gets used in the background a couple of times and then disappears almost completely. But you can’t deny that she has a really cool look. Purple is a badass super-villain color. So what became of that cool looking female member of the Brotherhood? Join me after the jump to find out! 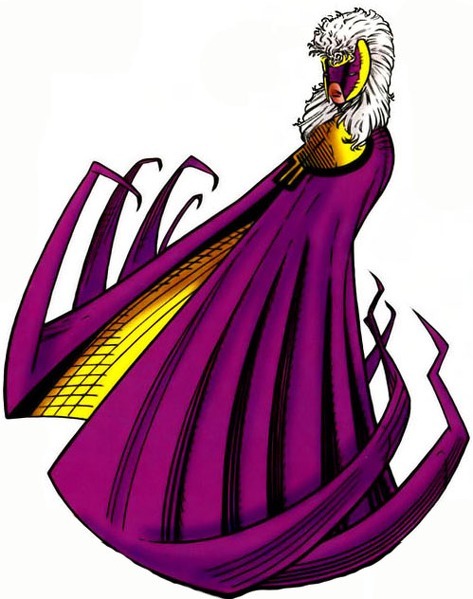 Eileen Harsaw debuted in 1992 as a member of Toad’s incarnation of the Brotherhood of Evil Mutants. 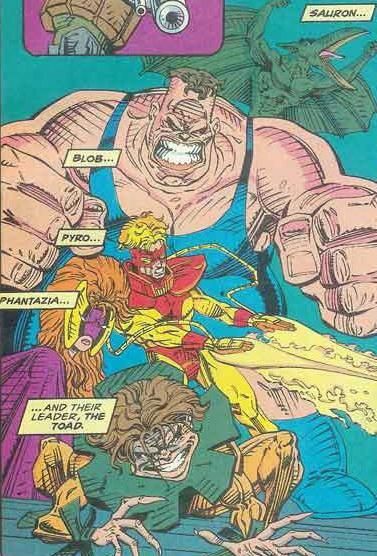 Toad grabbed up familiar X-Men bad guys Blob, Pyro and Sauron, and then somehow convinced a beautiful blonde woman to hang out with them as well. That’s Phantazia. Phantazia had the power to detect and manipulate electromagnetic energy fields, allowing her to pretty much do whatever the writer needed her to do, as long as it involved manipulating energy fields. She didn’t get much of a backstory, but continued to hang out with Toad and the gang through a couple of different stories in the 90s. They even somehow convinced her to flaunt around in a bikini somehow. I joke, but I think it’s worth noting that 90s comics managed to put Phantazia into a bikini despite her few appearances. Such were comics back in the day. Eventually the Brotherhood broke up and Phantazia disappeared into the ether. She was drudged up against about a decade later for an appearance in House of M, where she was one of Magneto’s elite guards, in a role so minor that I don’t think it was ever said out loud. After that event, not only was Eileen one of the many mutants to lose their powers, but she was also one of the few people to remember the events of House of M. In fact, the shift in realities drove her insane, and she was picked up by SHIELD to try and figure out what was going on. She hasn’t been seen since. She could still be in a nuthouse somewhere, a victim of the House of M.
I dunno. You probably shouldn’t, if I’m being honest. Phantazia was a nobody character with a nothing history who popped up in the 90s for no good reason. She accomplished nothing and was tossed aside as a casualty of the House of M.
Honestly, she just looks really cool. And having more female bad guy mutants is always fun. 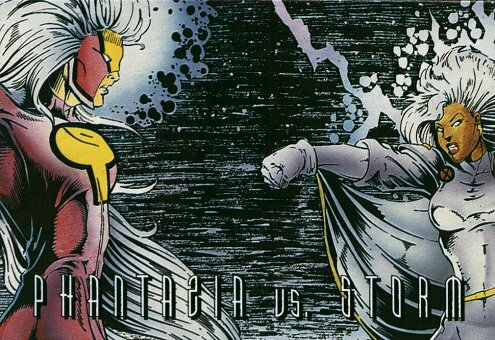 Phantazia is just a character I’ve always liked the look of, and she would be cool for a villain revival at some point. 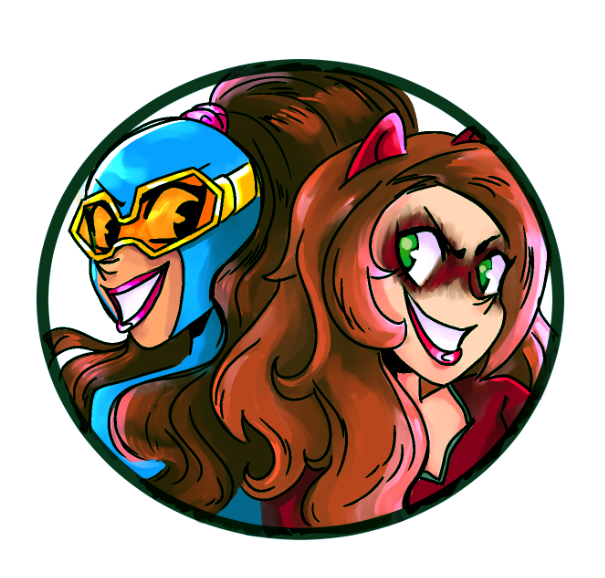 Posted on April 8, 2019, in Comics, Forgotten Characters, Marvel, X-Men and tagged Phantazia. Bookmark the permalink. 1 Comment. I dug Phantazia. There was potential there. I’d be totally down with her being brought back.